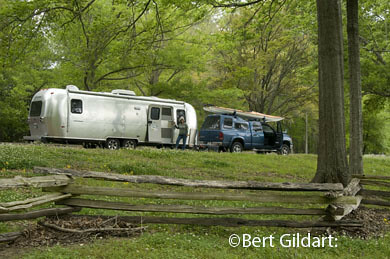 ©Bert Gildart: The Natchez Trace holds a special place in our hearts, for it’s a National Parkway on which we have spent a considerable amount of time. Almost 15 years ago, we produced a book about this 444 mile long parkway, published by FarCountry Press. Essentially, the book celebrated what has become our first national highway, a road first used by the old riverboat men. These early day travelers would load produce on barges and then float it downriver, to Natchez and New Orleans. Needing a route back home (this was before Robert Fulton developed his steam engine) they’d hike back home. With time, their tracks beat down a trail, and with yet more time, the effects of immense erosion caused the trail to deepen. With more time, more footsteps and yet more erosion, here in this portion of what is now Mississippi, at about Mile 20 along the Trace, the ancient path sunk particularly deep. Helping in this particular area was an ancient form of wind-blown soil known as Loess, and it erodes easily. And so, today, we have the Sunken Trace, and it was one of the first stops Janie and I made on this particular journey. 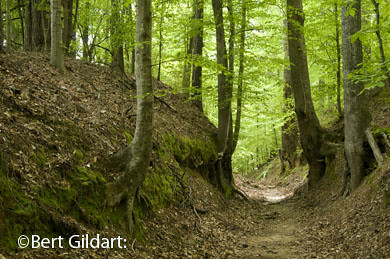 Sunken Trace, the result or erosion and thousands of footfalls. Lighting conditions were excellent, for it photographs best on overcast days. With its Spanish moss, exposed roots and much weathered appearance it was impossible not to reflect on the thousands of men who once traveled this area. Among the more famous or better known were old Abe Lincoln’s father, Andrew Jackson, numerous post riders and Captain Meriwether Lewis. Shown here, then, in these two photos are the modern day Trace and the ancient Trace, providing, together, one of the most unique national parks in the country. Probably, we’ll spend about a week gathering more photographs and updated material for an upgrade of our book, Two Centuries of Travel. This entry was posted on Sunday, April 12th, 2009 at 6:32 am and is filed under National Lands, Photography. You can follow any responses to this entry through the RSS 2.0 feed. You can leave a response, or trackback from your own site.